Zinc guttering for all four roof edges of e.g. your summer house or log cabin. 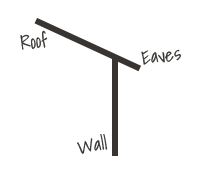 To calculate the perimeter of a hipped roof, just add the measurements of side A, B, C, D and E.
of the hipped roof, then select below an all-in-one gutter kit by clicking on the correct image (top view of hipped roof).